The famous Millennium Run (MR) simulations now appear in a completely new light - literally. The project, led by Gerard Lemson of the MPA and Roderik Overzier of the University of Texas, combines detailed predictions from cosmological simulations with a virtual observatory in order to produce synthetic astronomical observations. 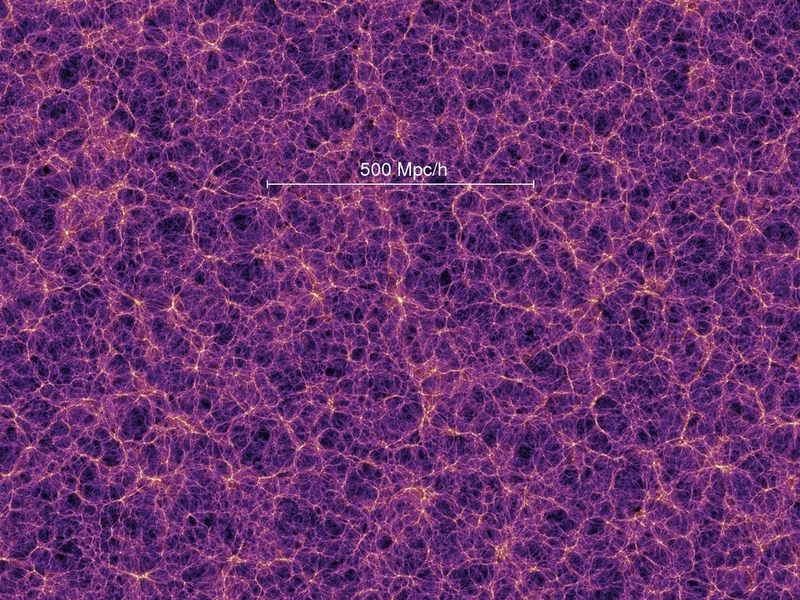 In analogy to the moment when newly constructed astronomical observatories receive their “first light”, the Millennium Run Observatory (MRObs) has produced its first images of the simulated universe. These virtual observations allow theorists and observers to analyse the purely theoretical data in exactly the same way as they would purely observational data. 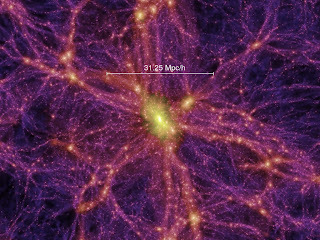 Building on the success of the Millennium Run Database, the simulated observations are now being made available to the wider astronomical community for further study. The MRObs browser - a new online tool - allows users to explore the simulated images and interact with the underlying physical universe as stored in the database. The team expects that the advantages offered by this approach will lead to a richer collaboration between theoretical and observational astronomers. False-colour images of the Hubble Ultra Deep Field as predicted by the Millennium Run Observatory (left) and as actually observed by the Hubble Space Telescope (right). The images measure about 5’ by 5’, and were constructed from virtual and real observations through the filters V (blue), i (green), and z (red). The resemblance between the virtual image constructed using the MRObs and the actual image seen by HST is striking. The MRObs images can be analysed in the same way as the real data, with the advantage that only for the MRObs images the underlying “reality” is known. Comparison of these kinds of simulated and real data will allow astronomers to test their methods, test how well the simulations reproduce the actual universe, and make predictions for future observations. 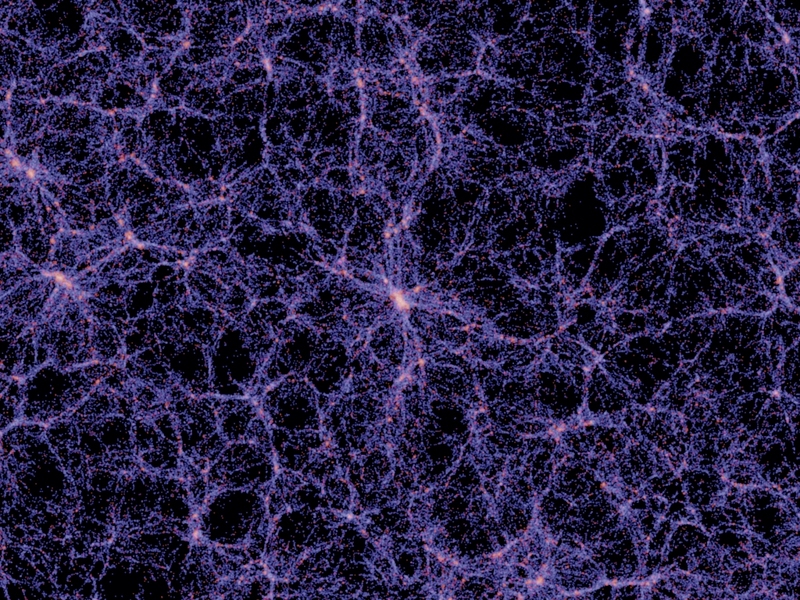 Cosmological simulations aim to capture our current understanding of galaxy evolution, aid in the interpretation of complex astronomical observations, and make detailed predictions for future experiments. Simulations and observations, however, are often compared in a somewhat indirect way: physical quantities are estimated from the observational data and compared to the models. An important complication with this approach is that observations typically give a highly distorted view of the universe, making the process of extracting physical information a challenge. Many problems in astrophysics could therefore benefit from doing it the other way round: the entire observing process is applied to the simulations, so that the models can be viewed fully from an observer’s perspective. A small team composed of current and former members of the Max Planck Institute for Astrophysics has now developed the Millennium Run Observatory (MRObs), a theoretical, virtual observatory that uses virtual telescopes to ‘observe’ semi-analytic galaxy distributions based on the MR dark matter simulations developed at MPA. The MRObs produces data that can be processed and analysed using standard observational software packages developed for real observations. How does it work? The MRObs produces fully physically-motivated, synthetic images of the night sky by stringing together a great number of products from cosmological simulations, various existing astronomical software packages, and software newly created for the MRObs. Halo merger trees based on the MR simulation (using only dark matter) form the backbone for the semi-analytic modelling of galaxies inside haloes. This modelling is based on simple recipes for, e.g., gas cooling, star formation, supernova and AGN heating, gas stripping and merging between galaxies. 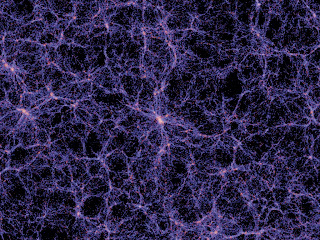 At each time step of the simulation, the physical properties of each galaxy are used to select stellar population templates from a library of theoretical spectra to predict the intrinsic spectra. ‘Light cones’ are constructed that arrange the simulated galaxies in a way that is similar to how galaxies appear to an observer on the sky. Next, multi-band apparent magnitudes are calculated, including the effects of absorption by the inter-galactic medium. The light cone is then projected onto a virtual sky, and the positions, shapes, sizes and observed-frame apparent magnitudes of the galaxies are used to build a ‘perfect’ or ‘pre-observation’ image. The perfect image is fed into the MRObs telescope simulator that applies a detector model (pixel scale, readout noise, dark current, sensitivity and gain), sky background, point spread function, and noise. The result is a realistic, synthetic telescope image. Source extraction algorithms are applied to the simulated image resulting in a catalogue of the apparent properties of all objects detected in the image. This catalogue of objects can be cross-matched with the higher level data available in the MR database in order to compare the real physical properties of the galaxies with those extracted from the images. The MRObs extends the MR simulations by producing data products that most directly correspond to observations, namely synthetic images and extracted source catalogues. 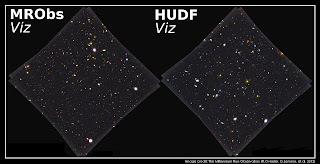 The data simulated with the MRObs so far includes portions of the Sloan Digital Sky Survey (SDSS), the Canada France Hawaii Telescope Legacy Survey (CFHT-LS), the Great Observatories Origins Deep Survey (GOODS), the GOODS WFC3 Early Release Science (ERS), the Hubble Ultra Deep Field (HUDF, see Figure 1), as well as the Cosmic Assembly Near-IR Deep Extragalactic Legacy Survey (CANDELS). The information provided covers light cone catalogues linked to structural properties of galaxies, pre-observation model images, mock telescope images and source catalogues that can all be traced back to the dark matter, semi-analytic galaxy and light cone catalogues already available in the MR database. This will aid theorists in testing analytical models against observations, aid observers in making detailed predictions for observations as well as better analyses of observational data, and allow the community to subject the models to new tests. 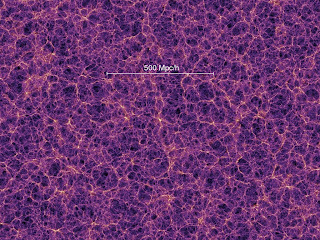 For example, the MRObs can be used to visualize the appearance of galaxy clusters, to predict the structural properties of galaxies across the stellar mass versus star formation rate plane (see Figure 2), or to answer the question of how many galaxies could be detected at a redshift of about 10. The data can be explored interactively in the MRObs browser (Figure 3). The development of the MRObs coincides with the celebration of the first 500 papers based on the MR simulations, proving that the MPA-led Millennium Run project is still as successful today as it was 7 years ago. Future expansions of the MRObs project are already underway, such as incorporating the more recent Millennium-Run II and Millennium XXL simulations to extend the dynamic range, implementing improved cosmological parameters and galaxy modelling techniques, and creating a wider range of virtual telescopes and simulated surveys that will aid theorists and observers alike.